In 1814, the 7th U.S. Infantry including Taylor's Company seized control of the village of Prairie du Chien, at the mouth of the Wisconsin River, and built Fort Shelby. The Northwest Fur Company saw the threat to its business on the Upper Mississippi. The traders gathered at Mackinaw in Michigan, and formed a militia called The Mississippi Volunteers. They joined their Indian allies and a few British regulars to retake Prairie du Chien. In July, the British force attacked the American fort and forced the outnumbered Americans to withdraw. They held the fort, renamed Fort McKay, until the end of the war. When the peace treaty left the Upper Mississippi in American hands, the British burned the fort and left. Many of the men who formed the Mississippi Volunteers continued to work in the Upper Mississippi fur trade after it came under American control. Those who portray Captain Thomas Anderson's company of the Mississippi Volunteers play the enlisted men, most of whom were French Canadian. Our costumes are typical clothes for the voyageurs. Our equipment is varied, including "captured" American muskets and accouterments, as well as British issues, civilian guns, and homemade accouterments. We practice British light infantry tactics, and members have long taken pride in being one of the best drilled units at events. 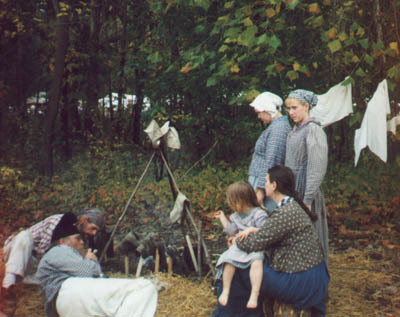 The events referred to above are reenacted annually in Prairie du Chien on the site of Fort Crawford, built by the Americans to replace the fort burned by the British. Check our articles for more information about the historic Mississippi Volunteers.